Many people care about what the others think. This is a real burden, because they always think that they are not able to dress good enough or do something the right way. The truth is that people would say bad things even if you do everything in the best possible way. There will always be gossip about how you walk, talk or act. This is why you need to stop paying attention to what the others might say or think. Doing things your way is the way to go! Even when you are doing weird things for no reason, you should be happy about it! Most of us love to party! No matter what the occasion is, having some good time with friends, good music and nice drinks is awesome! However, it seems that as the years pass, the party style we used to have before fades away. This is actually normal and the only thing left to do is remember the good old college days. As you can see in the photo above, these parties were pretty wild! 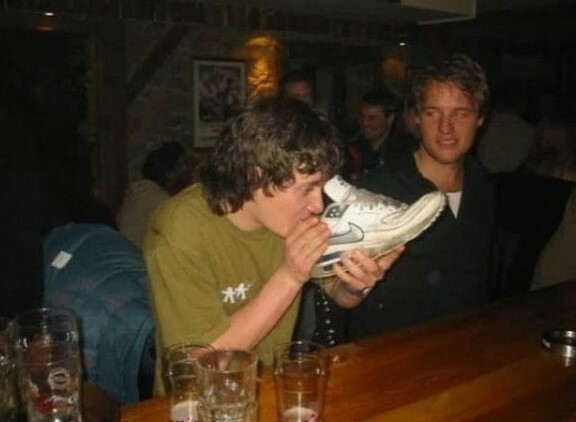 Of course, we never drank alcohol from a dirty shoe, but we still had a great time. These photos are really weird, but there has to be a story preceding them! There is no way that this person put these shoes on purpose or by mistake. We guess that there could be only one possible reason for this to happen. One of the shoes was probably damaged badly enough to be impossible to wear it. This is why emergency measures had to be taken and this ridiculous outfit was the result. The best thing is that the person couldn’t care less! This photo really made us laugh, but it also inspired us! The idea is really cool and we wish we did this to our mailboxes earlier! 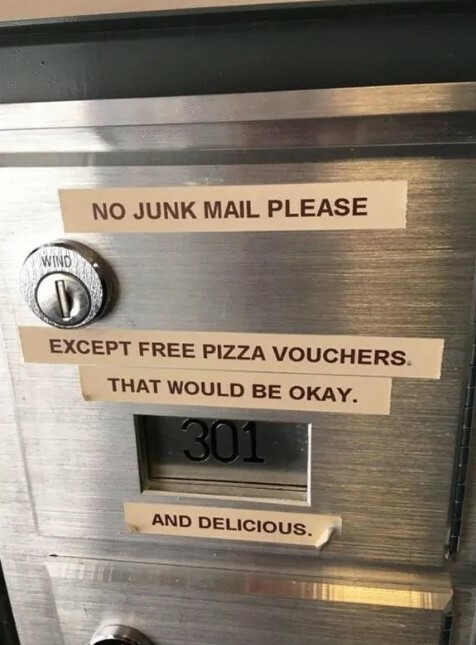 The so-called junk mail is something really annoying, actually. When you have junk mail in your email, just a few clicks will get rid of it all! However, a real postbox would literally get clogged with advertising materials, and nobody likes that, of course. We wonder if these labels actually work and we sure hope they do! The amazing photos you see are not what they seem to be! Of course, nobody would believe that somebody could fly around on a huge broom. This happens only in movies! Nevertheless, the images are really convincing and amusing, too! 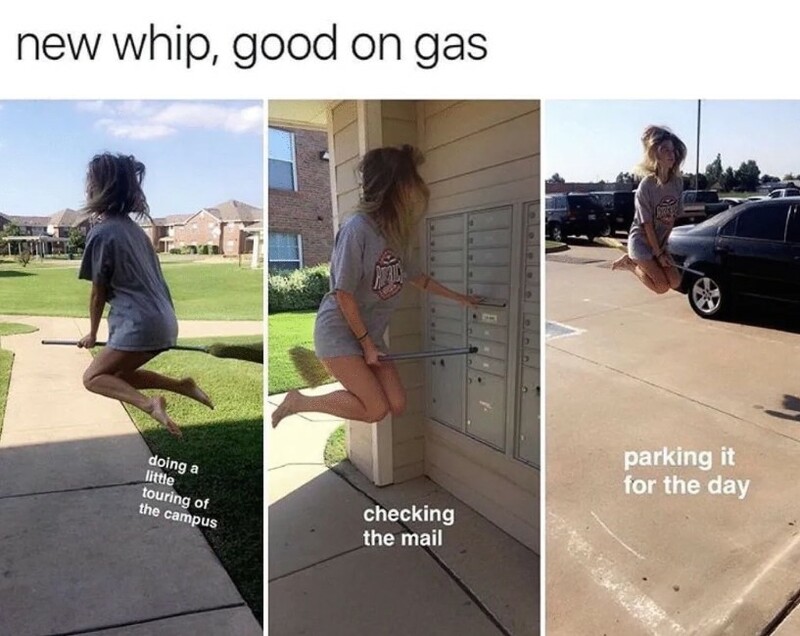 What the girl did was simply jump as high as possible. 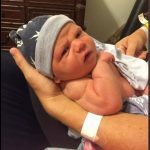 Someone timed the pictures perfectly and they appear to be as realistic as possible! Imagine if the girl could really fly with the broom! It would take a witch hunter to stop her! Many people spend a lot of money on vehicle upgrades. It doesn’t matter what car you drive or how much money you are willing to invest in it. Every vehicle can be customized. Sometimes the little details make the biggest difference. This is the reason only skilled professionals have to install the upgrades, or you would end up with something similar as the one pictured above. 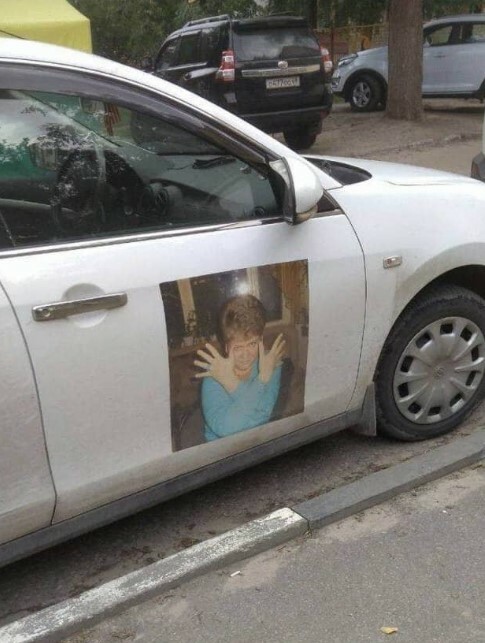 The sticker on that car is the most unusual type of vehicle decoration, but it is definitely unique and this is what matters the most. Going out on a date is always related to a lot of preparation work! This is especially true for the ladies, because they require much more time to prepare. The photo you see here is a definitive proof! 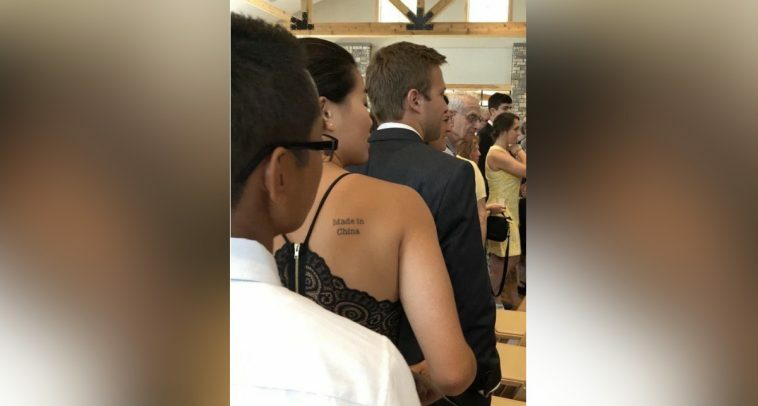 As you can clearly see, the lady looks like she chose a nice black dress for the date. However, the gentleman probably did not spend that much time preparing for the big night. 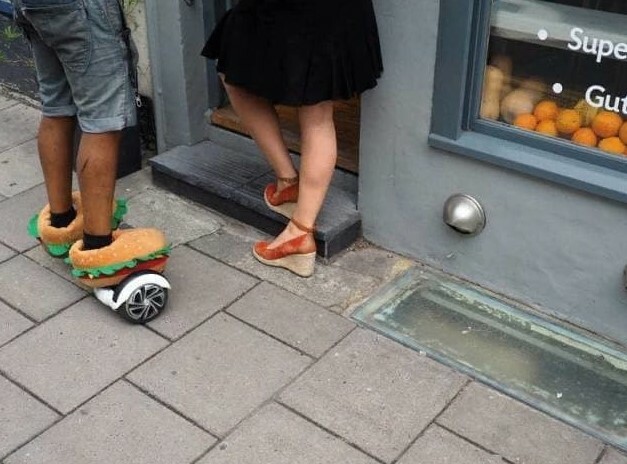 The hamburger-styled slippers and the hover board definitely gave him away! If you are forced to drive a lot of miles daily, you have probably seen all kinds of things and situations on the busy streets. We also thought that we have seen it all, but there obviously are some unique situations! This funny photo shows a man who did something unusual with his car. He was clearly rear-ended by a Jeep and the accident was probably more than frustrating. 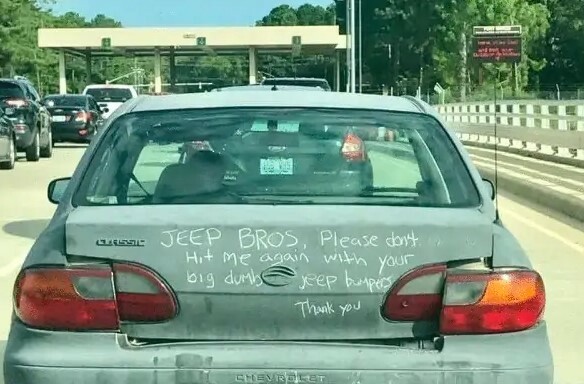 This is why he decided to write this on his vehicle, which almost looks like a cry for help. We guess that the majority of the households across the world include at least one pet. Of course, the most common pets people prefer to have are cats and dogs. Despite this fact, there are many individuals who prefer more unusual type of pet. It can be something exotic like a lizard or a snake, but it could also be unexpected like a rat or a ferret! However, we have never seen someone keep a duck as a pet! 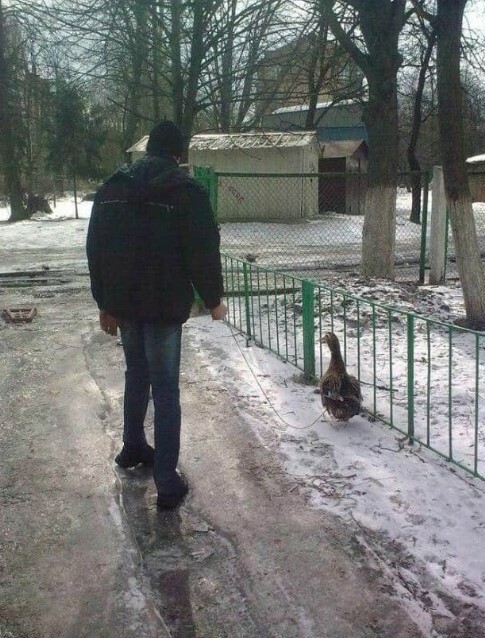 This person obviously enjoys walking his pet duck, and everything seems normal to him, despite the fact that it looks weird. We have always dreamed of walking inside a theater with unlimited supply of snacks and drinks. Unfortunately for us, the harsh reality is different. 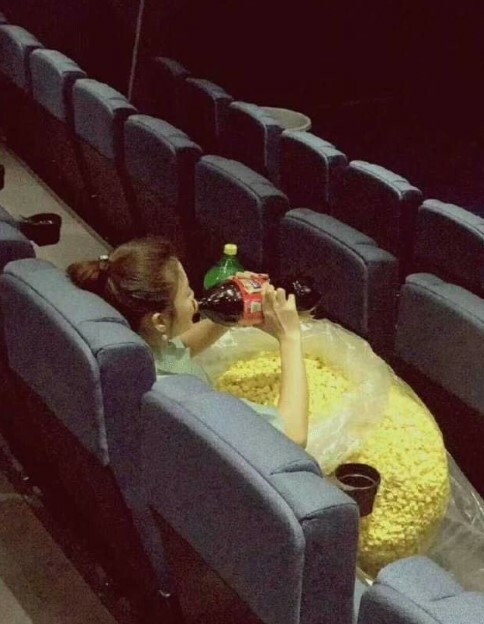 Nobody is allowed to bring snacks inside unless they are bought from the cinema. This means you have to pay for extremely overpriced soda and popcorn, meaning that you would probably not buy a large quantity. We have no idea how this person was able to bring in this huge amount of food inside, but it is definitely something we would like to do as well. Some photos are a real mystery. Sure enough, there is not much to see here. 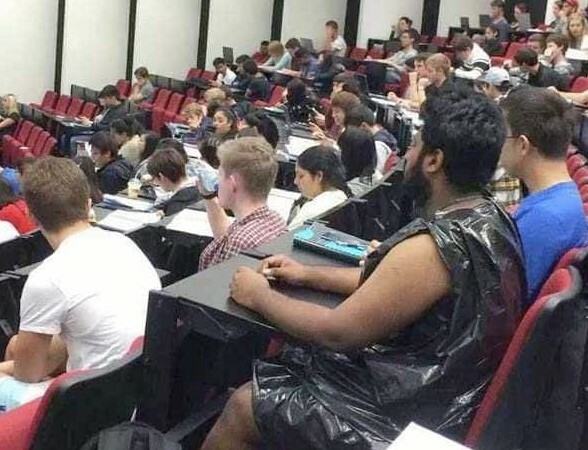 The only curious thing is the person dressed in a garbage bag. When you consider that this is actually a lecture, you need to admit that it is a weird sight to see! Of course, there has to be a reasonable explanation for this. Nobody would attend a public event dressed like that willingly! Maybe this person lost a bet or intended to provoke someone. Here is one of the weirdest photos on this list. 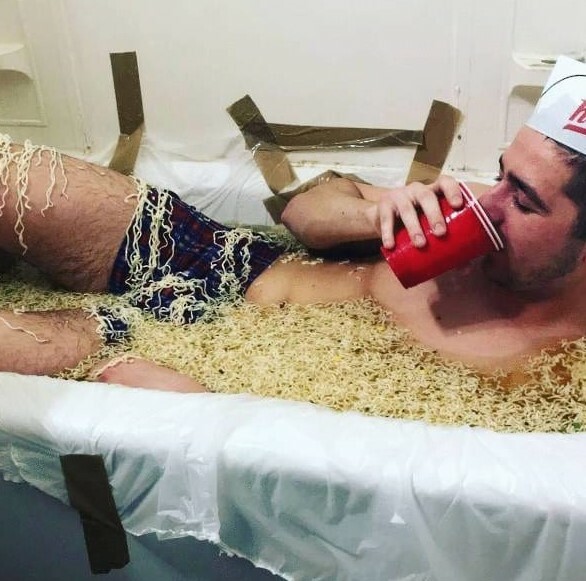 As you can see, a grown man looks to be really comfy inside a tub full of ramen noodles. This is something that you will probably never see again, but that’s okay, because nobody would like to see it again! Of course, there is no way that this photo could have a reasonable explanation behind it. 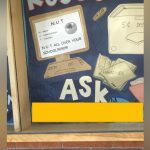 Our guess is that it was either a prank or it was done out of boredom. Well, there is not much that could be said about this photo. It speaks for itself, and we are afraid to look at it twice! 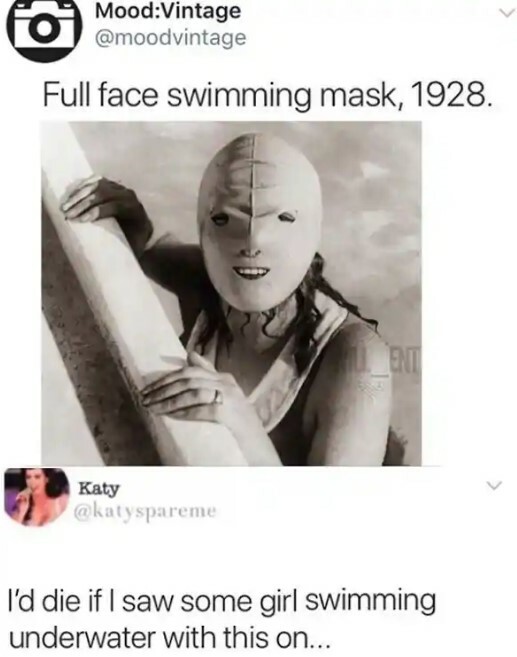 Apparently nobody found this mask to be disturbing 90 years ago! We guess it must be effective, but it still looks horrifying! Just imagine how someone wearing such a mask swims towards you while you are diving. This would definitely be something that could give you nightmares! We have seen a lot of weird things and some of them are included in this list. However, what you are about to see is definitely something that will surprise you! 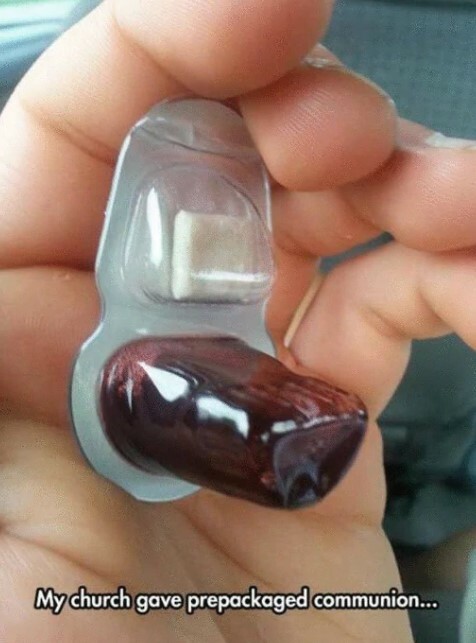 Regular churchgoers are probably used to the wine and bread that are consecrated and shared between everyone. However, someone decided to skip this part and came up with these things. They might look handy, but they are probably a bit inappropriate. You probably know real pizza lovers would never accept the pineapple toppings. Better still, you are probably one of the people who would never tolerate this kind of pizza. However, someone came up with this clever idea. 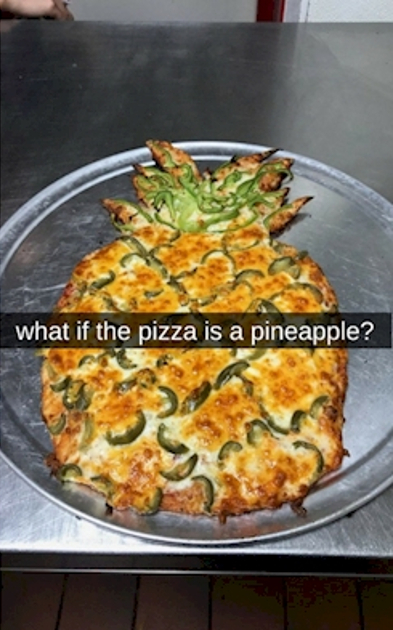 We are sure that this pizza was created to mock the original recipe for pineapple-topped pizza. We admire the idea and we believe that everyone would enjoy a slice of this delicious pizza despite its shape. 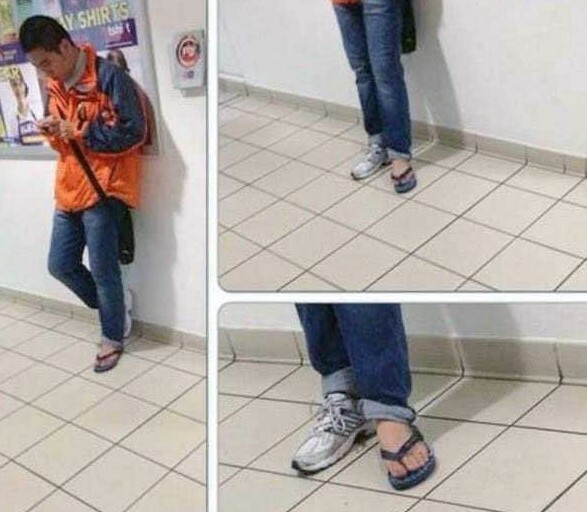 This photo might appear to be normal until you see the item underneath this person’s feet! It seems weird, but there is a perfectly good explanation which is more than obvious! 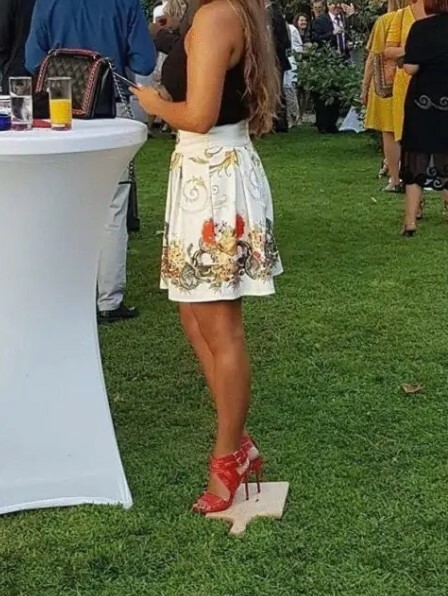 This person attended an event dressed in an elegant outfit and red high heels which are stunning. However, walking on grass with those thin and sharp heels would be almost impossible, not to mention dangerous! We guess that this cutting board was a nice idea that would prevent an accident.